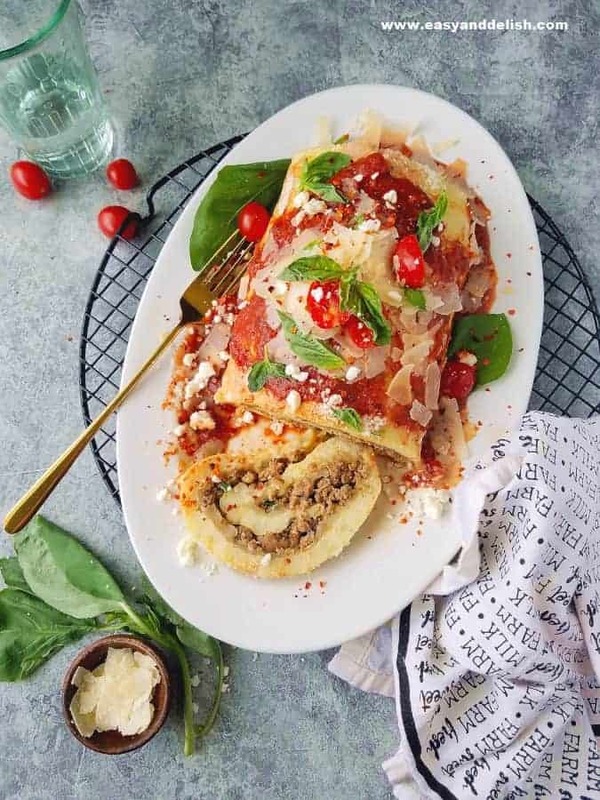 Potato Roulade (Rocambole de Batata) is a jelly roll made from mashed potatoes baked in a sheet pan, filled with ground beef and cheese, rolled, and then topped with tomato sauce and Parmesan cheese. An easy dish to wow family and guests. A personal favorite of mine from my Grandmother’s recipes is this Potato Roulade, also known as Rocambole de Batata in Brazil. 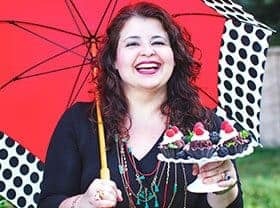 This is a recipe that I have been searching for for a long time and was only able to find very recently. I was so excited that I just couldn’t hold it back from you. This is something great to serve for a Sunday lunch with your loved ones, or on Easter. It brings back great memories of my family’s Sunday meals — and hopefully it will brighten yours as well. But don’t you worry one bit if you are not yet familiar with this type of recipe. It’s an easy main dish made with everyday ingredients, yet able to impress the most demanding of palates. 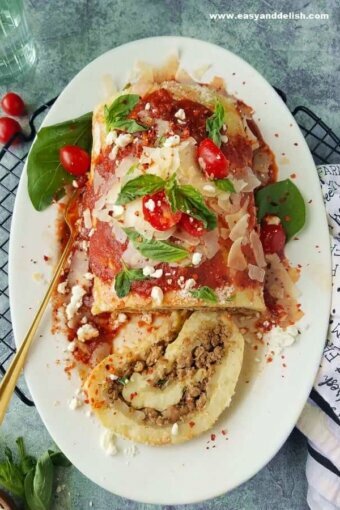 My grandmother’s Potato Roulade is nothing more than a potato jelly roll filled with cheese and ground beef and topped with tomato sauce and Parmesan cheese. It is so comforting and satisfying… a real crowd-pleaser. If you wish, you can also prepare it gluten-free! It follows the same concept as a beef roulade — a slice of steak rolled around a filling, such as other meats, cheese, and/or vegetables. Thus a roulade is a European dish consisting of a filled rolled meat or pastry– meaning that it can be either savory (such as a chicken roulade) or sweet (such as a chocolate swiss roll). The Italian involtini, braciole, and saltimbocca all fall in the same category. 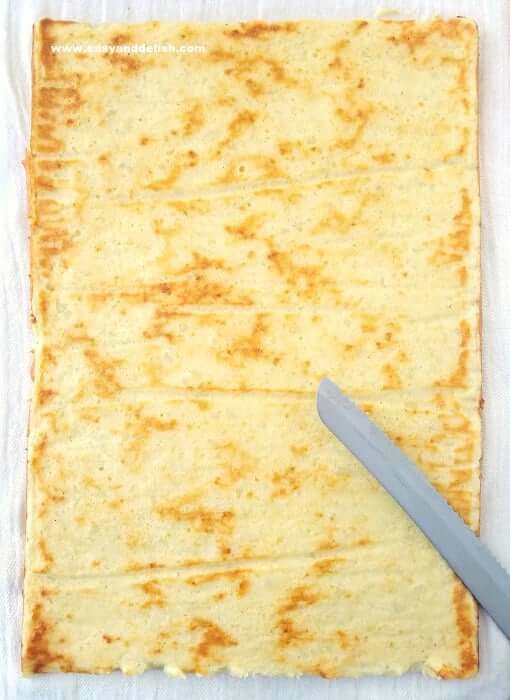 But unlike meat roulades that are braised in wine or stock, our Potato Roll Cake is baked in a flat pan because its base is different. Wash potatoes, place them in cold water, and cook on medium-high for about 12-15 minutes or until fork-tender. Drain; remove peel while warm using a pairing knife or by rubbing peel with a clean cloth. Mash cooked potatoes well and stir in butter, Parmesan cheese, milk, seasonings, and egg yolks until uniform. Then, stir in flour and baking powder until no lumps are visible. In a separate bowl, beat egg whites until stiff; fold into the potato mixture; set aside. Preheat oven to 350 degrees F. Grease a 9 x 13-inch jelly roll pan, line with parchment paper, and then grease paper. Pour potato batter into the pan, spreading uniformly with a spatula. Bake for about 35-40 minutes or until a toothpick inserted in the center comes out clean. Meanwhile, cook ground beef. Heat oil in a no stick skillet and cook onion over medium for about 3 minutes, stirring occasionally. Add garlic and cook for about 1 minute. Do not let brown! Add ground beef and brown on medium-high heat, about 2 minutes. Reduce heat to medium, stir in seasonings and tomato sauce, and let cook for about 4-6 minutes. Stir in vinegar and let cook until evaporate. Stir in chopped parsley or green onion. Set aside. Once Potato Roulade is done cooking, loosen edges with a paring knife. Place a warm wet cloth on top and then the back of a larger jelly roll pan. Invert and trim off hardened short edges only. 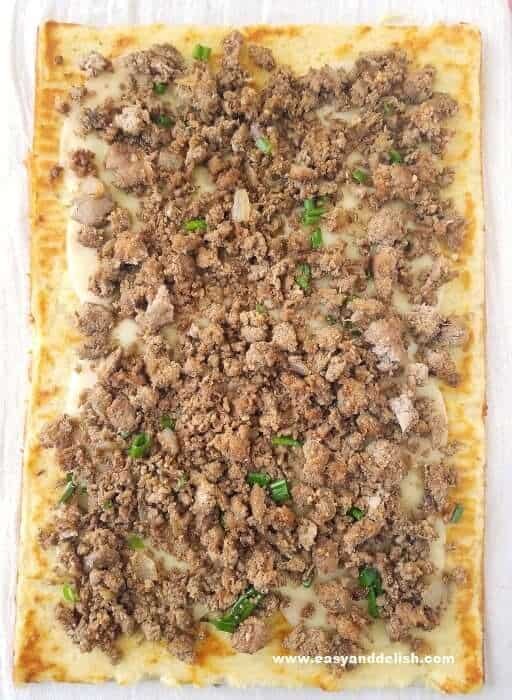 Layer on the cheese and then the cooked ground beef, each in a single layer. Roll carefully while warm with the help of the wet cloth. Carefully transfer roulade to a serving platter. Top with warm tomato sauce and Parmesan cheese. Garnish as desired and enjoy. Love roll cakes? Try our Chocolate Cake Roll. Can you make Potato Roulade ahead? Yes! Make the Potato Roulade ahead, cover well, and refrigerate for up to 3-5 days. Right before serving, reheat and only then top with tomato sauce and Parmesan cheese. Can you reheat Potato Roulade? Yes! To reheat a whole potato roulade, place it onto a baking sheet lined with parchment paper. Cover loosely with foil and bake in a preheated 250° F oven for about 15-25 minutes, or until warm. Serve topped with sauce and cheese. If sliced, reheat in the microwave for about 30-60 seconds, depending on the number of slices. Mash cooked potatoes well and stir in butter, Parmesan cheese, milk, seasonings, and egg yolks until uniform. Then, stir in flour and baking powder until no lumps are visible. Drain; remove peel while warm using a pairing knife or by rubbing peel with a clean cloth. In a separate bowl, beat egg whites until stiff; fold into the potato mixture; set aside. Preheat oven to 350 degrees F.
Grease a 9 x 13-inch jelly roll pan, line with parchment paper, and then grease paper. 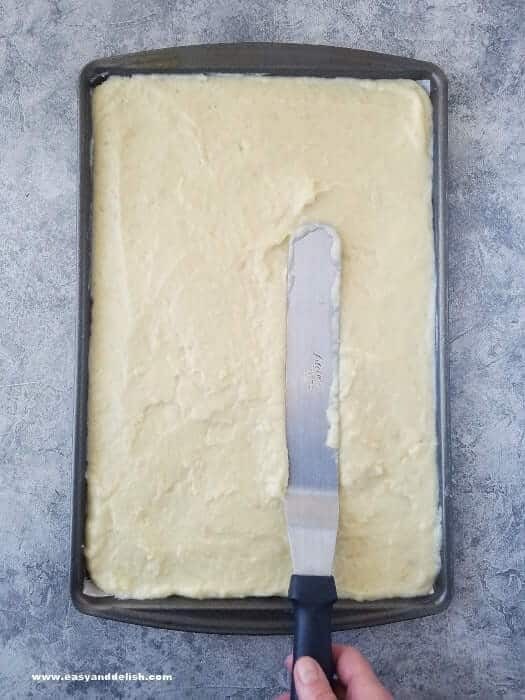 Pour potato batter into the pan, spreading uniformly with a spatula. Bake for about 35-40 minutes or until a toothpick inserted in the center comes out clean. Meanwhile, cook ground beef. Heat oil in a no stick skillet and cook onion over medium for about 3 minutes, stirring occasionally. Add garlic and cook for about 1 minute. Do not let brown! Add ground beef and brown over medium-high, about 2 minutes. Reduce heat to medium, stir in seasonings and 1/4 cup tomato sauce, and let cook for about 4-6 minutes. Stir in vinegar and let cook until evaporated. Stir in chopped parsley or green onion. Set aside. Once potato roulade has finished cooking, loosen edges with a paring knife. Place a warm wet cloth on top and then the back of a larger jelly roll pan. Invert, remove paper, and trim off hardened short edges only. 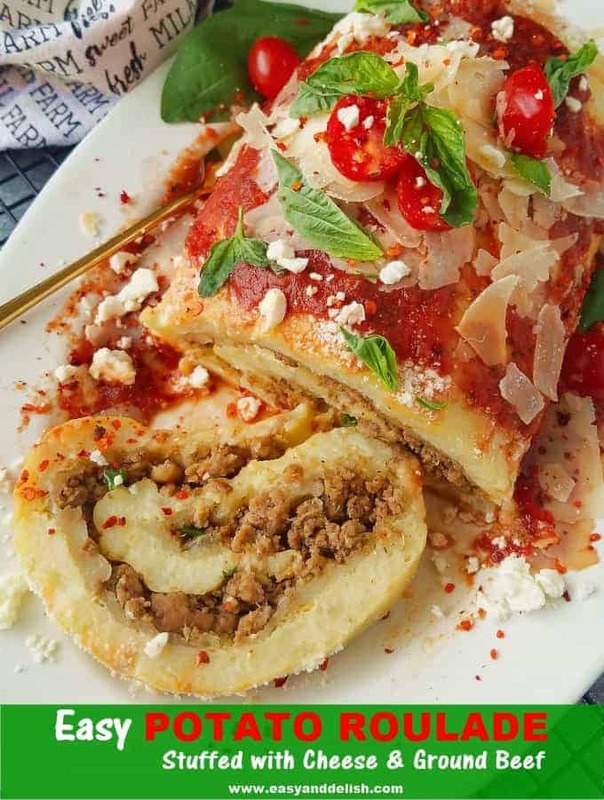 Layer on mozarella cheese and then the cooked ground beef, each in a single layer. 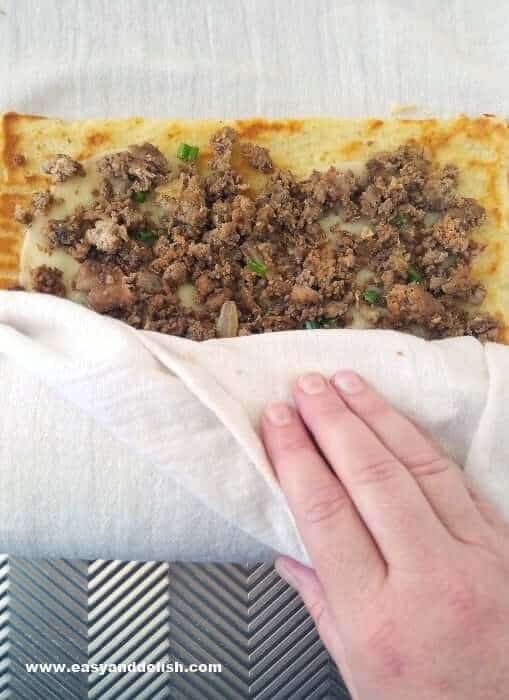 Roll carefully while warm with the help of the wet cloth. Carefully transfer roulade to a serving platter. Top with 1/2 cup warm tomato sauce and shaved Parmesan cheese. Garnish as desired and enjoy. MAKE-AHEAD: Make the Potato Roulade ahead, cover well, and refrigerate for up to 3-5 days. Right before serving, reheat and only then top with tomato sauce and Parmesan cheese. HOW TO REHEAT: To reheat a whole potato roulade, place it onto a baking sheet lined with parchment paper. Cover loosely with foil and bake in a preheated 250º F oven for about 15-25 minutes, or until warm. Serve topped with sauce and cheese. If sliced, reheat in the microwave for about 30-60 seconds, depending on the amount of slices. As always, Denise brings a warm feeling of family gatherings & delightful food on our screens. I’ve made sweet roulade before, but not savory. This is the perfect opportunity. Can’t wait to try it out. Dear Denise 🙂 It seems similar to gnocchi but soooooo much updated ! So great idea ….. will definitely make for a week end ! Thank you! 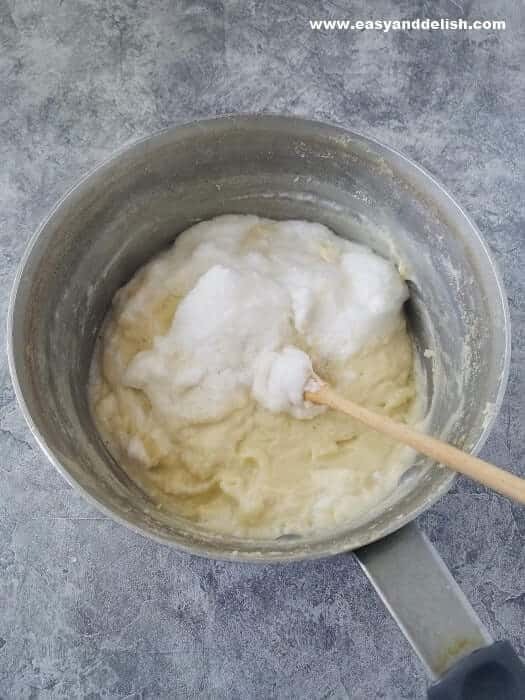 It is my Grandma’s recipe. What a pretty presentation your potato roulade makes…it certainly would impress guests at a dinner party. Best meat ‘n potatoes dish ever! This is so much fun and looks good. New dish to me, and an excellent one — thanks. What a wonderful way to enjoy “meat and potatoes”! Not sure one slice would be enough of this beauty.